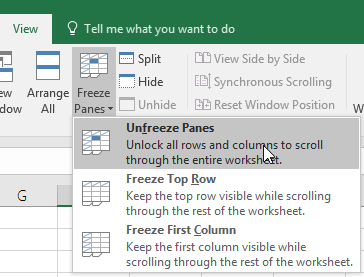 To keep an area of a worksheet visible while you scroll to another area of the worksheet, go to the View tab, where you can Freeze Panes to lock specific rows and columns in place, or you can Split panes to create separate windows of the same worksheet. Select View > Freeze Panes > Freeze First Column. The faint line that appears between Column A and B shows that the first column is frozen. Select View > Freeze Panes > Freeze Panes. Select the cell below the rows and to the right of the columns you want to keep visible when you scroll. On the View tab > Window > Unfreeze Panes. Note: If you don’t see the View tab, it’s likely that you are using Excel Starter. Not all features are supported in Excel Starter.